That quiltings says “Joe 09” — because all artists have to sign their work. Joe’s meandering doesn’t show up very well in photos, I’ll try to take some other shots in better light. I bought this as a kit last year, with a certain young male relative in mind. (Colin is his 3 year old cousin, the one I had in mind…but I didn’t tell Joe that…). Joe informed me that he would like to quilt it, and that when it was done wiht it’s trip to New Hampshire, we should give it to Colin for his birthday. I think I might be winning the battle to turn them into civilized human beings. Just remind me of that the next time they giggle hysterically over their bodily noises. How cute is it that he wants to send it to his cousin! I think you better stick to Will being your quilty buddy since Joe seems totally bothered in that first pic. I REALLY hope they both win. 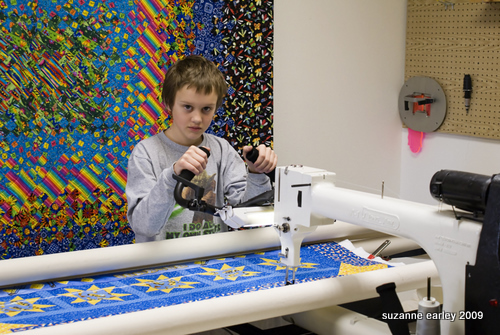 I think I have that same expression while quilting sometimes. They are both doing a great job of quilting and I am sure they will turn into civilized humans at some point – mine did. What a sweet heart – see they will turn out ok! 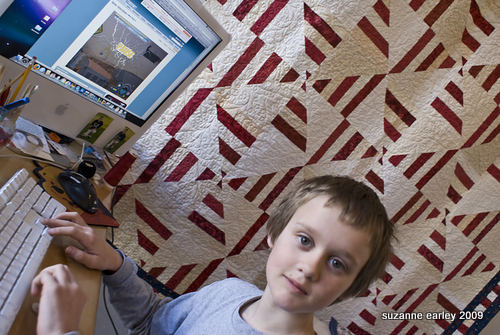 Looks like he is doing a great job on the quilt!